On March 2 We had discussed about the two possibilities of Long term GANN chart. In that post i had observed 4800 as the long term support in first kind of long term GANN Chart and 5050 as a resistance in second kind of long term GANN Chart. As of now the market is confortably trading above 5100 for the past three days. 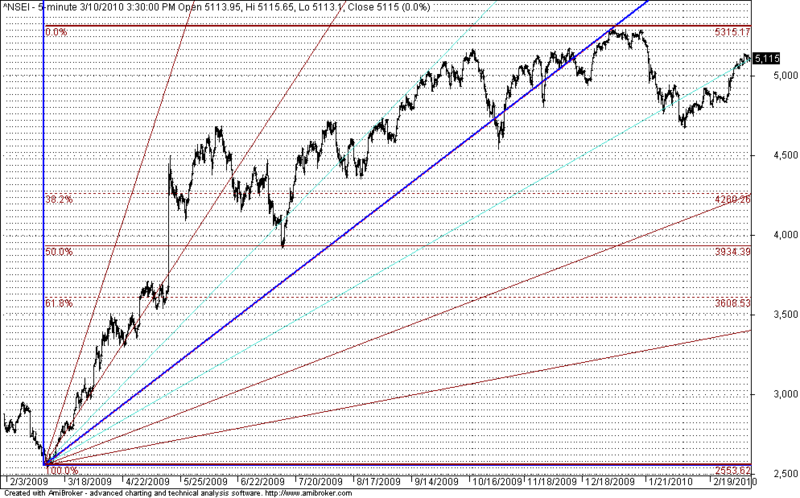 So I prefer the Second Possibilites of Long term GANN Chart shown below. 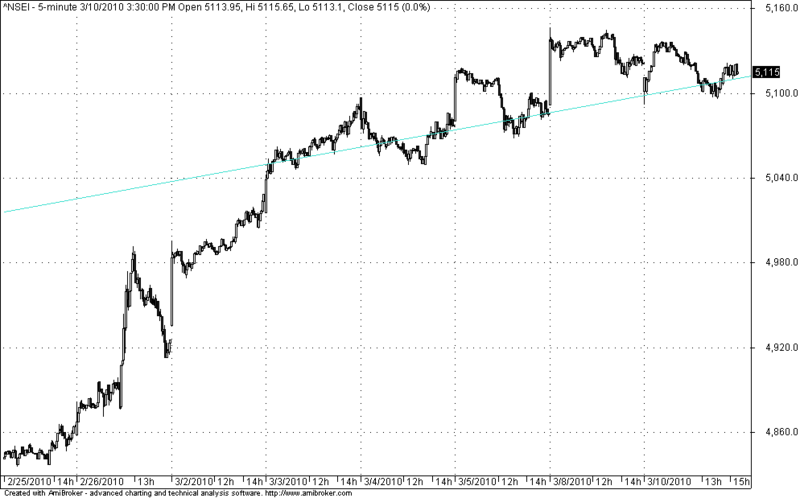 from the last zoomed charts of Nifty iam able to find that market is busy in holding that trend line. Iam just keeping my stop loss for all sort of long. Any day market closes below 5100 I need to reverse the postion to shorts as the long term suports are pointing towards 4260. Thanks for the nice presentation. 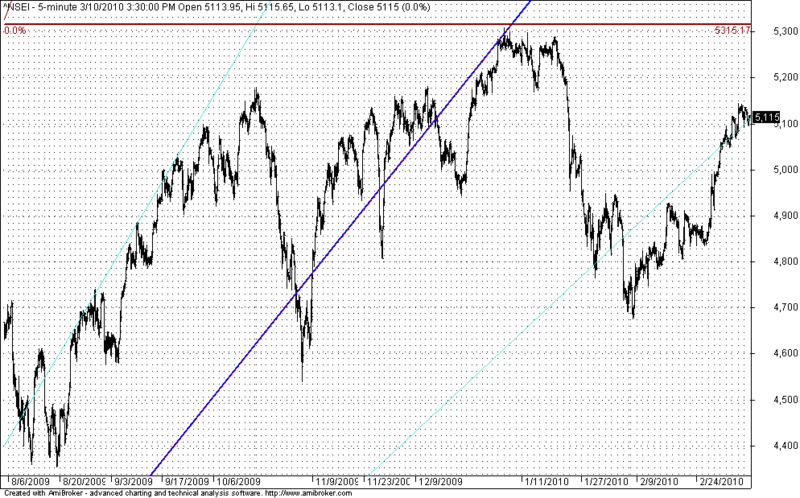 According to me, there is a strong Bearish Wolfe pattern formed in nifty, and the point 5 has been reached. Added to this the common indicators like stoch and RSI are heavily over bought. May be one can see a another dull day tomorrow with a small dull red candle, and after which the blood bath must begin. Also i think the support of 5100 levels will not hold good. 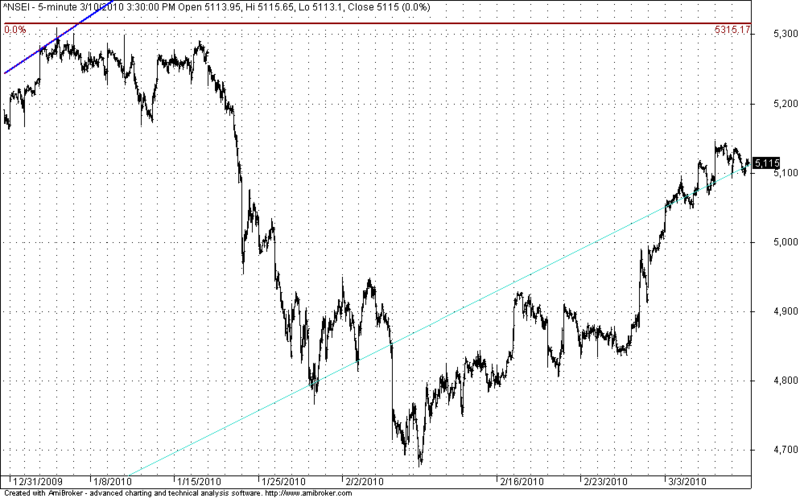 May be 4800 is worth watching for. Please correct me rajendran, if my interpretation of MARKET IS WRONG. Good analysis of nifty it gives very good insignts into the probable supports. GANN long term charts should be used on a larger timeframe (Daily/weekly) ? Pls. clarify .